I love the Farmers Market. More specifically, I love to wander around the Farmers Market to kill time between morning and afternoon classes, before Annenberg opens for lunch but after they have closed for breakfast. I tend to stroll and admire the booths, but practice restraint. If I let myself have free reign I would end up taking home half of the food from the fair. 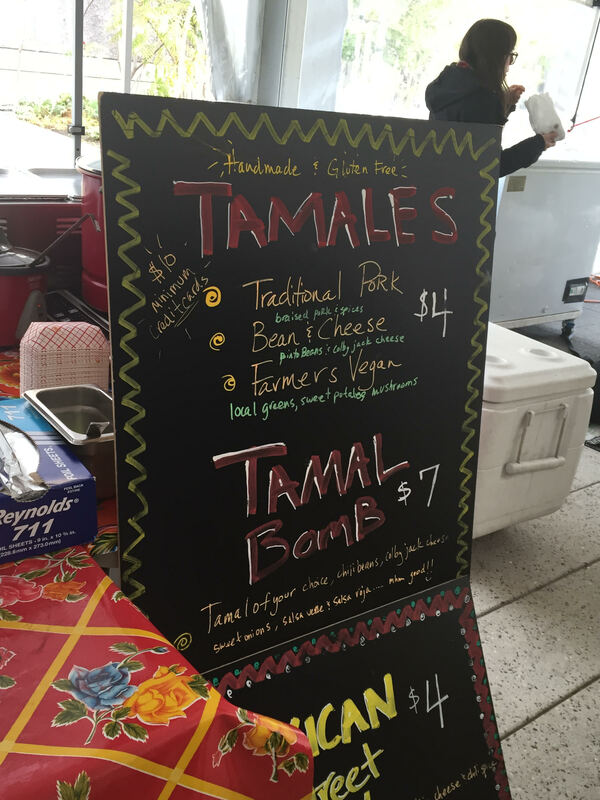 Still, the red and white chalk declaring TAMALES $4 caught my eye – glaring from the “Tex Mex Eats” booth. I had never had tamales. 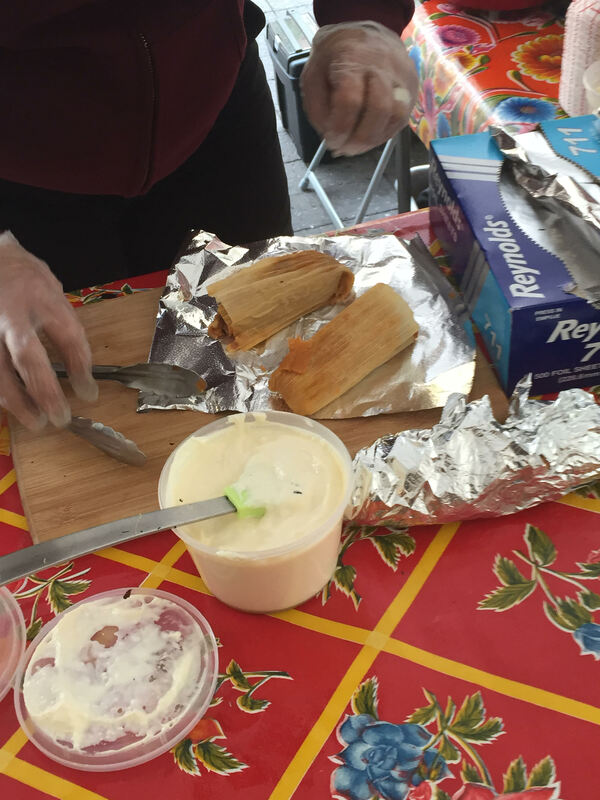 What exactly are tamales? Mexican, I knew. Handmade, the sign explained. Also gluten free. Hmm. Were they spicy? I do not always do well with spicy. I used to think Chipotle was too spicy, although I have of course learned the error of my ways. The woman running the booth pulled out two cylinder shapes with spring roll textured wrappings. The next customer orders a traditional pork to walk with and a corn wrapped up without a single glance at the sign. The woman running the booth quickly pulled out another cylinder, peeled of the wrapping, and handed it to the woman. She then retrieved an unsealed cob of corn, a tub of butter, powdered cheese, and red powder. She peeled the corn, painted it all the way around with butter, lies it on tin foil, and coated it evenly with both powders. She looked down at it again. Added more red powder. Then she sealed it all in, wrapping the tin foil tightly around the yellow and white kerneled corn. Because I have always loved Mexican corn and I was still tentative to try something new, I started with the corn. The surface was thick with butter and the red powder, the corn itself juicy, hot, and fresh. The red powder made me nervous. It reminded me of hot curry powder. And it burned my lips, set my mouth aflame, but in the best way. I devoured all but the patch of burned kernels. Then, after turning and turning the cob as if more yellow corn would magically appear and deciding that such a method would not be successful, I ate a few of the blackened ones in the absence of more yellow and white kernels. I rewrapped my empty cob in its buttery foil and returned it to the brown bag the woman at the booth had given me. I retrieve my next trial, the tamales. I peel off the outside wrapper, uncertain of what to expect. Inside of the more solid wrappings, the tamales are sweet potato orange and soft. I opt for bean And cheese first, thinking it safer. It burns sweet and spicy on my tongue, stronger than the corn. The traditional pork is more savory, dissociating in my mouth. I slice a few pieces of both, eat them together so the flavors can play off each other. The traditional pork balances the spice of the bean and cheese, but I find I like each better individually. Even though the bean and cheese hurts me, I cannot stop. I alternate between the two so as not to be overwhelmed by the spice of the bean and cheese or finish the traditional pork too quickly. Next time I see the booth I am likely to order a few traditional pork tamales to go. It was nice to try some new foods, but the spicy life still isn’t for me. If you noticed some bright orange signs and balloons on the sidewalk recently, you may have been lucky enough to stumble upon Harvard Scare in Harvard Square, the October 29th festive start to an event-filled weekend hosted by the Harvard Square Business Association. 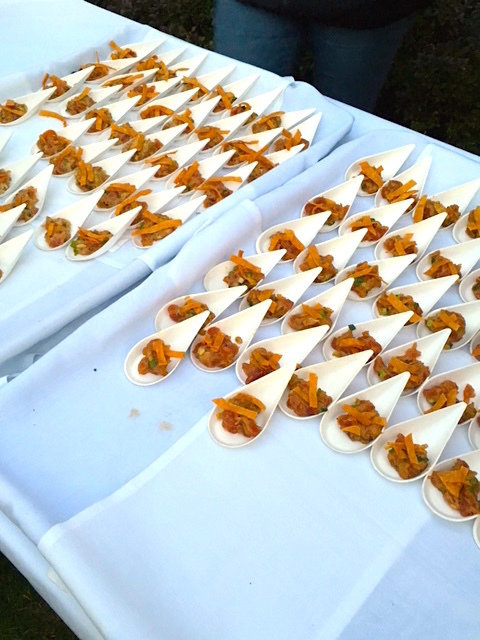 In keeping with the spirit of Halloween, the food sampling was both spicy and sweet. The set up boasted tables from great restaurants and shops in the Bow and Arrow district, including Boston Burger Company, Follow the Honey, Salt and Olive, Grafton Street, Hong Kong Restaurant, and Zinneken’s. To add to the ambiance, a talented jazz band called Scubaphone played through the whole event, clad in Halloween costumes no less! What the event lacked in grandiosity, it made up for in flavor. Grafton Street offered a beautiful spoonful of tuna tartar, and Follow the Honey – whose staff was decked out in fancy beekeeping gear – had a great selection from which you could taste. Zinneken’s waffle bites were a delicious treat to end the night. Since they’re made from a dough and not a batter, they have a great, thicker texture that makes them all the more satisfying. The sampling might be over, but these restaurants are here to stay. ‘Till next year!